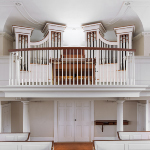 Andover Organ Company has reinstalled the William A. Johnson Opus 281 in the balcony of Church on the Hill (UCC), Lenox, Massachusetts, where the organ has sat for 134 years. 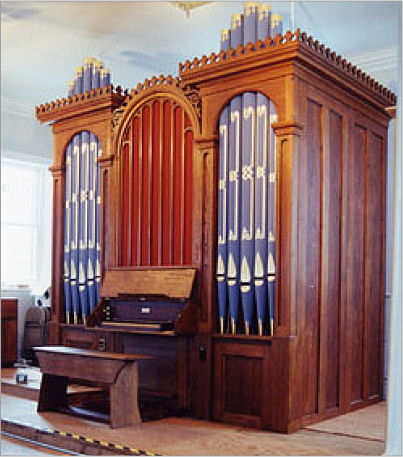 Andover removed the organ from the 1806 building for restoration in August, 1991. 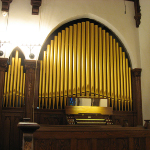 This organ is an amazingly well preserved example of the work of Johnson, a stonemason who became interested in organs at age 29 when the Hooks installed an organ in his home church in Westfield, MA. He began building organs during the winter months when stonemasonry was slow. He was described by a contemporary in 1849 as "one of the most ingenious men in this region." By the end of his career, his company had built 500 organs, Opus 281 being in about the middle, built in 1869. His work is very well respected today. 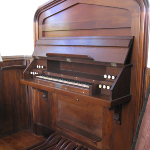 It is rare that such an organ has not been relocated or altered. Andover’s task was to repair cracks, remove dirt, replace leather, and reproduce the stenciling on the case pipes, which had been covered in gold paint. The company routinely cares for instruments in excess of 150 years old. Organist John Cheney led the fund-raising effort, feeling that it was up to him to save the organ. Working with Andover's co-tonal director John Morlock and president Donald H. Olson, they established a plan to restore the instrument. Andover had already releathered the reservoir in 1988. The case pipes were stripped layer by layer, original designs meticulously traced, and original blue with gold leaf motifs restored by Eleanor Richardson of Andover. Old brown paint and stain were removed from the case by Al Hosman, and an oil finish applied. An unexpected treasure turned up inside the organ - one organist had slipped her lists of hymns through a crack in the case at the end of every Sunday's service. Little did she know they would be celebrated as an archive years later.